It’s me lucky day! 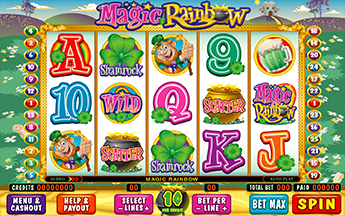 Play Magic Rainbow where its Saint Paddy’s Day 365 days a year. Pots o’ Gold, 4 leaf clovers and green beer are all coming your way. The charming little leprechaun will lead the way for you to collect your winnings. At the end of the rainbow lies the emerald meadow where you’ll claim your bonus treasures. It’s a beautiful day out on the green pasture over looking the rolling hills. 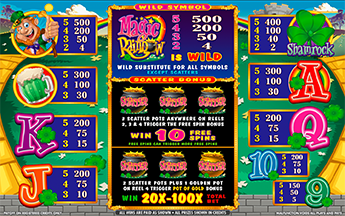 Two Pot o’ Gold Symbols and one Golden Pot o’ Gold symbol in any position trigger the Bonus Game. Choose up to 9 out of 10 Pots o’ Gold to win 20x - 100x your total bet. Player continues to select icons until empty pot is selected. A 2x Multiplier, if picked, doubles the entire bonus win! 3 scatter symbols in any position on reels 2, 3 & 4 earns you 10 Free Spins, with the chance to retrigger additional Free Spins.